Another year is behind us, and what an eventful one it was for specialty pharmacy. Health care was the No. 1 focus in virtually all political campaigns during last year’s election season. In 2019, the outcome of those elections will likely affect the specialty space. Not a day goes by without a health care–related headline, and our industry continues to be influenced by change, some positive and some less so. However, our mantra stays the same: Take care of the patient and we all win. Some great way to stay on top of the latest trends include registering on SpecialtyPharmacyTimes.com, following any of our social media channels, and signing up to receive our industry-focused emails and continuing education resources. At Specialty Pharmacy Times®, our readers are among the most informed in the industry; in this issue, we will review the top specialty trends to watch in the year ahead. In the FDA’s own words, “innovation drives progress.” Under Commissioner Scott Gottlieb, MD, the FDA has made it very clear that when it comes to innovation in the development of drugs and therapeutic biological products, the agency’s Center for Drug Evaluation and Research supports the pharmaceutical industry at every step of the process. This is a change from the past, when the pharma industry and the agency were often at odds. It’s not that the core group of people at the FDA changed; it is, rather, “under new management.” There is a deeper understanding that the agency’s commitment is to provide the scientific and regulatory advice needed to bring new therapies to market. Most of the new specialty approvals can be categorized as innovative products that have never been used in clinical practice. Others are the same as or related to previously approved products and will compete with them in the marketplace. From the top down, the emphasis is on seeking new treatment options for patients and advances in health care for the American public. For our industry, this means more specialty products and the subsequent expansion of our footprint and relevance. Drug approvals are the lifeline of our industry and the key driver of growing a successful specialty practice. 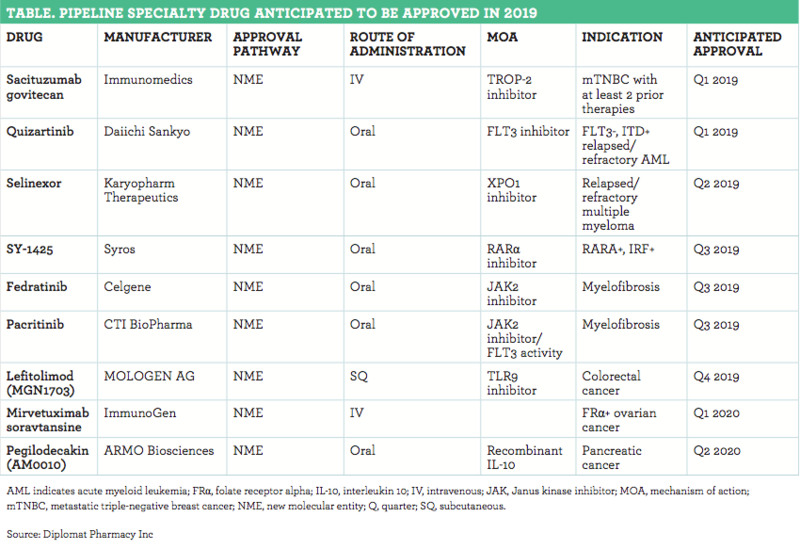 Several specialty drugs are expected to be approved in the first half of 2019 (Table). Talazoparib (Talzenna)—an oral poly (ADP-ribose) polymerase inhibitor indicated for the treatment of patients with deleterious or suspected deleterious germline BRCA-mutated, HER2- negative locally advanced or metastatic breast cancer. In late 2018, the FDA initiated the expanded access (EA) program, providing a pathway for patients to access investigational drugs, biologics, and medical devices for serious diseases and immediately life-threatening conditions outside of clinical trials when no comparable or satisfactory approved alternative therapy options are available. Although there is work to be done, expect that specialty pharmacy will play a key role in the FDA-administered. Requests for individual patients are made using newly developed access applications. Some requests are granted immediately by phone, whereas nonemergency requests are generally processed within a few days. There is a close interplay between the FDA, the provider, the patient, and the pharma industry. Because these are patient-specific requests, a manufacturer often relies directly on their hub services and contracted specialty pharmacy to provide fulfillment services. The manufacturer is at the center of ensuring that the patient receives ongoing therapy under specific conditions as granted by the approval. Working together with the physician, the pharmacy facilitates the process. All stakeholders are engaged to help review the safety data generated by using an investigational drug or biologic through the EA pathway. It is hoped that the improvements to this program will not only provide immediate therapy to the patient but also help accelerate the approval process as warranted. The EA program can be another great pathway to a specialty pharmacy obtaining early access to a drug—even prior to an approval. Seek out the right folks in the industry or any service providers working on their behalf. The administration continues to play a prominent public role in chipping away at health care spending, and the high cost of specialty products is at the center of that process. The administration will likely find willing partners in both the Congress and Senate; however, President Donald Trump has the power to bypass the House and Senate, if necessary, by using a pilot program to test 3 ways to lower the cost of drugs—including negotiating for some drugs directly administered by doctors under Part B. Given the growing role of specialty pharmacy with infused and injectable products, these initiatives will affect the specialty business model. The goal is to keep pricing in line with the far lower prices paid in many other countries, in which governments often take an active role in setting prices. Expect the administration to empower private sector vendors to negotiate pricing, similarly to what has been done with Medicare Part D. The whole rebate mechanism is greatly in flux, with a large pharmacy benefit manager (PBM) recently launching a rebate-free formulary solely based on efficacy and wholesale acquisition cost. It just might take a presidential decree or an act of Congress to revamp our pricing system of reimbursement, and this could be the year it happens. Remove some of the gaming of the regulatory and patent processes by brands that inhibit the approval of generics and biosimilars to boost price competition. Include prices in drugmaker advertising to enhance price competition. Increase the use of value-based pricing by expanding outcome-based payments. Enforce the prohibition of the gag rules that prevented pharmacists from informing patients when they could pay less out of pocket by not using insurance. Reserve Part D incentives only for manufacturers that stop raising prices. Expand the use of co-pay discount cards in Medicaid. Require that beneficiaries be informed about their out-of-pocket costs prior to receiving a Part B drug or a Part D drug prescription and whether lower-cost alternatives exist. Require safety net hospitals paid under Medicare Part B to use their 340B drug discounts to provide care to more low-income and vulnerable patients. Require the FDA to issue a guidance to address some of the ways in which manufacturers use risk evaluation and mitigation strategy programs to delay or block competition from generics. Review the imbalance on reimbursement based on the site-of-care for patients to ensure site neutrality between the inpatient and outpatient settings. This will allow providers to be reimbursed appropriately with care provided in the least expensive setting. It seems the push to manage the cost of specialty products has been based mainly on drug prices, ignoring value. Expect to see an even greater emphasis in the specialty industry turning to value-based contracting (VBC), which seeks to link the price of a prescription drug to its clinical or economic performance. Specialty pharmacy plays an integral role in ensuring that the patient receives an optimal outcome when using a specialty pharmaceutical; therefore, specialty pharmacy’s role will be even more important as new reimbursement schemes, such as VBC, roll out. However, the expanded use of value-based payment models will require a higher tolerance for financial risk, regulatory change, and the willingness and flexibility to collaborate closely with payers, specialty pharmacy, PBMs, and patients. 5. The Year of the Biosimilar? The US biosimilar market continues to lag other global markets, much of which is a result of the bureaucratic approval process. The FDA’s leadership has shown a commitment to biosimilars via increasing competition across specialty pharmacy classes and launching more biosimilars. There are some potential blockbusters in 2019, such as bevacizumab-awwb (Mvasi) and trastuzumab-dkst (Ogivri). The FDA is seeking to raise the educational bar with providers about the safety and efficacy of biosimilars. It was not long ago that traditional generics were introduced with a good deal of skepticism regarding their efficacy, which changed when economic pressure from payers forced compliance and conversion. We expect to see the same process evolve for biosimilars. There is too much money on the table with potential new approvals to let this opportunity pass. These factors indicate that 2019 could be a big year for biosimilars. The strategy behind the merger of CVS Health and Aetna was laid out from the beginning. Larry Merlo, chief executive officer of CVS, said that the combined company will emphasize lowering medical costs by increasing adherence to prescription regimens, broadening its membership base, and providing more services through its brick-and-mortar stores. The combined company also plans to close gaps in care, reduce unneeded emergency department trips, and shift costly therapies to less expensive care sites. With the growth in infusion specialty pharmacy, we also expect to see the increased emergence of stand-alone infusion care in retail settings. The platform is already in place with the Coram acquisition, and CVS Caremark currently has the highest revenue-producing specialty pharmacy. Combining platforms means this giant could be an even more dominant force in specialty. Prime Therapeutics and Walgreens and their joint venture, AllianceRx, bring together a pharmacy, PBM, and health plan. This partnership has combined the largest national retail network with a central specialty pharmacy and mail service company. Like the abovementioned CVS initiatives, these well-established organizations drive lives and use to the specialty arena. To round out their play, Walgreens partnered with Humana on several strategic ventures, including taking equity stakes in each other. And the plot thickens: The market has already speculated on Walmart purchasing Humana. As Express Scripts and Cigna begin their integration, how will that partnership affect specialty pharmacy? Clearly, these companies will enhance their purchasing power by both the increase in lives under management and exposure to differing biopharmaceutical manufacturer rebates across their books of business. Both organizations have well-run specialty pharmacies and have shown a willingness to be tough negotiators when they hold leverage. It can be expected that Express Scripts and Cigna will be emboldened by the expanding specialty portfolio of second-generation products and biosimilars. These mergers and future acquisitions in the specialty industry will undoubtedly have a profound impact on patients, providers, and the overall health care industry. In the world of limited distribution products, manufacturers will increasingly be pressured to include payer-owned specialty pharmacies in their networks or risk greater access barriers to their products from these payers. Non-payer-owned specialty pharmacies will face even greater challenges from these factors. In early 2018, Amazon, Berkshire Hathaway, and JPMorgan Chase announced plans to collaborate on a new health care company seeking to both provide high-quality care and reduce costs. The 3 organizations hope to pool their resources to take an innovative and disruptive approach to health care. One area of their focus involves developing a more effective way to manage specialty drug spending. Thus far, not much information has leaked from this entity; however, they have staffed their leadership and, combined with PillPack, should be a closely watched group in 2019. The health system specialty pharmacy continues to be the most significant segment of the industry. Given that hospitals are often where our sicker patients end up, this integrated, collaborative, and clinical environment is at the forefront of growth. Key drivers include 340B pricing and the past few years’ tremendous shift toward community-based physician practices being absorbed by health systems. These large institutions have made significant investments in training, data systems, and payer access. As such, payers recognize the value of these systems in providing a better view into the overall continuum of care from inpatient through outpatient and into the community. Many hospital networks have combined resources through a collaboration with their group purchasing organizations to form key alliances. Manufacturers are seeing the value in these large entities can bring to their products, particularly in the infusion space. Despite the drivers mentioned above, the opportunities for community specialty pharmacy remain strong. The reality is that health care is still a relationship business. People need to interact with people, and face-to-face will always be the baseline—that is how humans are wired. Services provided by the community pharmacy and pharmacist have played a very active role as a key component of the health care delivery system. Community pharmacy has a strategic advantage, with the broadest network of outlets in the US market today. Plus, consumers generally know and trust their community pharmacist. It stands to reason that when given the opportunity to maintain a professional relationship with their local pharmacist on specialty products, patients will chose their community pharmacy over other providers. The big chains, such as CVS and Walgreens, have already built integrated hybrid systems to network specialists into their traditional pharmacy locations, in addition to several community-based specialty pharmacy locations that are in place. Specialty products not of limited distribution often serve as the entry point for emerging specialty pharmacies. If these pharmacies are able to prove professional excellence, they can use their established competency to gain access to new niche products. The big 3 wholesalers already take pride in their independent networks claiming them as chains. If distributors successfully gain access to products on behalf of emerging networks, the playing field stands a better chance of increasing fairness. We do not have a crystal ball, but Specialty Pharmacy Times® has withstood the test of time and evolved with the industry: 2019 marks 9 years since our launch. We hope the insights you find in this journal will help you be more informed and successful in the year ahead. Specialty Pharmacy Times® is committed to setting the publication standard through peer-written and reviewed articles focused on the real world of specialty pharmacy practice. We welcome your feedback on this topic and any topics you would like us to cover in future editions. Please reach out to me at dsteiber@specialtypharmacytimes.com. We also encourage you and your colleagues to subscribe to this unique journal by logging on to www.specialtypharmacytimes.com. Enjoy this issue and pass it on!